If your order weighs less than 13 ounces, save huge on shipping with USPS first class (with tracking number). This product weighs 37.8 oz. Nature’s Sunshine VitaWave supplies essential vitamins and minerals that may be missing in the modern diet. 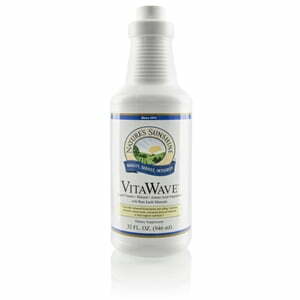 VitaWave includes 17 vitamins at 100 percent of the daily value. Natural black raspberry adds flavor and powerful antioxidant properties to the formula. VitaWave mixes vitamins and minerals in a base of herbs, amino acids, trace minerals, and other key nutrients. Instructions: Adults: Take two tablespoons (1 oz) daily with a meal. Children: Take one tablespoon (1/2 oz) daily with a meal.